A very funny animated movie that might have a very basic plot, but certainly delivers in terms of the laughs. 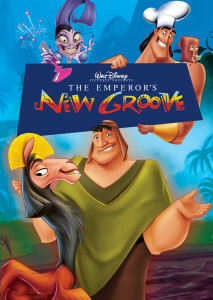 The Emperor’s New Groove is a fun, simple-hearted movie. It’s about a kingdom where the Emperor has been turned into a llama by his evil advisor and now needs to make it back to his palace to set things straight. The only problem is that the person who he needs to help him is a man name Pacha, who he had dealings with when he still looked like the Emperor, that weren’t so nice. The Emperor planned to build a summer home on the hill where Pacho lives with his family. And now Pacha and the Emperor, two guys who started out hating each other, are forced to go on a mission together. The movie works because of its humor, more than anything else. The casting here is perfect, from David Spade to Patrick Warburton (Seinfeld’s David Putty.) This movie is smart enough to break the fourth wall on a number of occasions and look for new ways to tell a somewhat familiar story. It works. 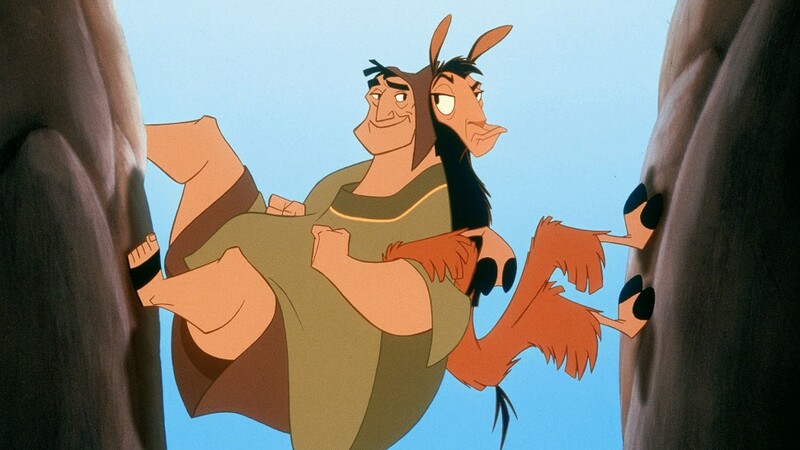 The Emperor’s New Groove is one of the funniest animated films around. Considering the time it came out, right after the Toy Story movies made it big, and right before Shrek, this is one of the last hand-drawn animation films, before computer generated animation completely took over the marketplace. As the last great one of its kind, this movie is a pretty good representative of how much fun these types of films could be. It has a simple story, but a nice quest for the characters, and a hell of. a lot of great humor. The movie is about Kuzco, the Emperor of the Incan Empire, who lives in a palace and is incredibly mean to all those who serve him. When the movie starts, Kuzco (voiced by the very snarky David Spade,) is actually a llama caught in the middle of a rainstorm, trying to sleep in a swamp. Spade’s voice narrates the whole thing telling us how terrible it is that he ended up here and how he wasn’t always a llama in a swamp. He then takes us back in time to learn about how he got here. This is where we see Kuzco as the Emperor, sitting on his throne. He is presented with a lineup of beautiful women to choose from for his bride, and rejects them all. He does this by insulting each one of them. Then he has an old man thrown out a window for bumping into him and “throwing off his groove.” Clearly this is not a nice guy. When a man named Pacha (John Goodman,) comes to visit him from the village, Kuzco asks Pacha about the hilltop where he lives. Kuzco wants to know exactly what area of the hill gets the most sun so he can build his summer home on that spot and kick out Pacha and anyone else who lives there. Kuzco also fires his advisor, Yzma (voiced by Eartha Kit,) for making decisions without consulting him. She then conspires to have Kuzco killed, with her henchman Kronk, (voiced by Patrick Warburton.) The two of them plan to give some poison to Kuzco, only Kronk mixes it up and accidentally gives Kuzco a potion that turns him into a llama. Kuzco the llama then ends ip in Pacha’s cart, right as Pacha is leaving the palace. Once on the road, Pacha finds that he’s got a llama in his cart and that the llama is none other than the Emperor, Kuzco, who was going to build a summer home on Pacha’s hilltop. Kuzco insists that Pacha take him back to the palace, but Pacha wants a promise that Kuzco will abandon his plans for building the home in this location. Once the agreement is made, Pacha and Kuzco set off for heading back to the palace. Here, they encounter one challenge after another. The two of them get chased by jaguars and fall off a rope bridge. They have to work together to use their backs against each other in order to climb out. There are also a number of instances where each of them saves the other’s lives. Still Kuzco plans to go back on his word to Pacha about not building the summer home on the hilltop, as soon as he is back at the palace and returned to Emperor appearance. And while all this is going on, Yzma has figured out what happened to Kuzco, and that he is out there, somewhere, and she plans to find and kill him. There’s a great scene at a restaurant where Kuzco and Pacha are in there at the same time that Yzma and Kronc are also in there. And we get tons of close calls where Yzma almost notices Kuzco. There’s a lot of old school-style slapstick here, like a scene where Yzma and Kuzco sit at two different tables across from each other, both looking at menus, and every time on of them puts their menu down, the other puts their menu up. Another slapstick moment that happens during this restaurant sequence involves a revolving door that characters keep walking through which leads to the kitchen. It is again Kuzci and Yzma who keep running in, through the revolving door, to tell the chef something, and both keep missong each other. As could be expected, Kuzco and Pacha form a friendship while on their road trip / mission to get back together. But this doesn’t just happen over the two of them saving each other’s lives. It doesn’t happen when Pacha overhears what Izma and Kronc have planned for Kuzco, and then tells the Emperor what they are up to. It only happens when Kuzco hears for himself that these two are up to no good and that his people don’t even miss him. This moment might be a nice twist on the usual way a character goes through an arc, but it happens too quickly and is not nearly as memorable as it should have been. Other than that, however, the movie is great. There is a lot of fun to be had here and the casting is dead on the money. Spade voicing a snarky wiseass is terrific. Goodman playing the lovable kind and gentle giant is also a nice move. This movie preceded Monster’s Inc, the film where Goodman voices the big blue monster, Sully, by one year. That film is Goodman’s animation masterpiece, but this one serves as his warmup or springboard to launch him into doing that one. And then there’s Eartha Kit and Warburton (Putty from Seinfeld,) both fitting their roles and character perfectly. tThe Emperor’s New Groove is a fun movie. That story might not be anything special, consisting of a simple power overthrow situation and also a simple character arc, but that’s okay. The humor is here and it really works. Plus the characters are very entertaining. This is a fast moving, simple minded kind of animated action film. The ideas are so basic and sometimes ridiculous that the movie fully acknowledges that fact to get in on the joke. For example, when something of value falls off the side of a building, and lands on a trampoline, sending it flying back up into the air, there’s a joke about what a trampoline would be doing there to begin with. The movie takes that kind of movie within a movie approach. It even breaks the fourth wall from time to time, to have Kuzco rewind the footage we were watching or pause it to cross things out and draw all over the screen. It’s all in the interest of making us laugh, and it works.